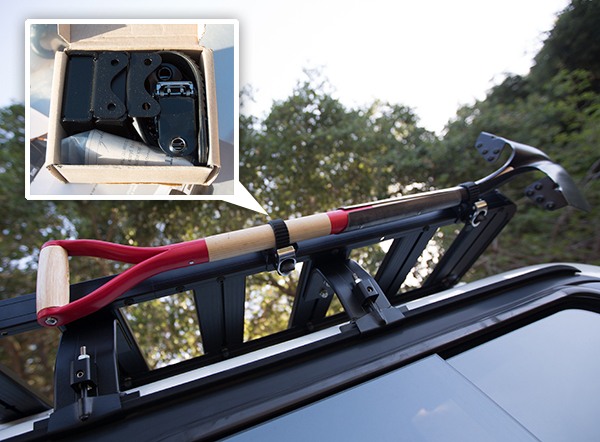 The NOTFZJ80 Project continues… one of the most important parts of roof top camping is having a roof rack that can handle the weight of the tent, the people inside the tent, and any other gear that’s going up there - and reading forums we quickly learned that quite a few people learned that the hard way using normal roof racks! 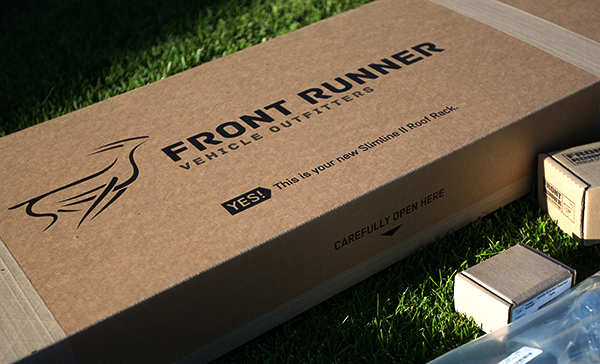 Well when we visited Front Runner Outfitters (the one with those AMAZING ads! 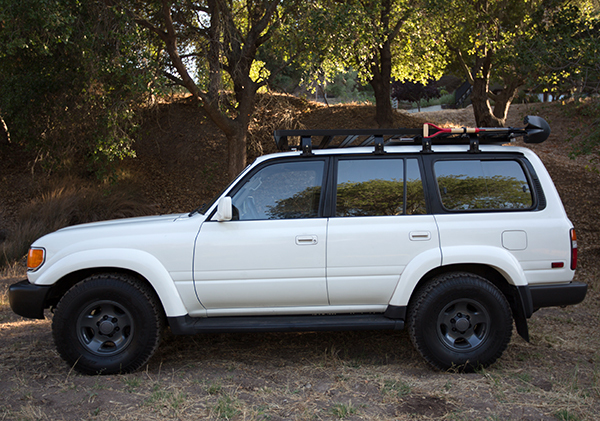 ), I got caught up on all things off-road/overlanding, and learned that over the last 15 years, if you’re cruising around Africa (and South Africa especially) the majority of roof racks you see will be theirs! 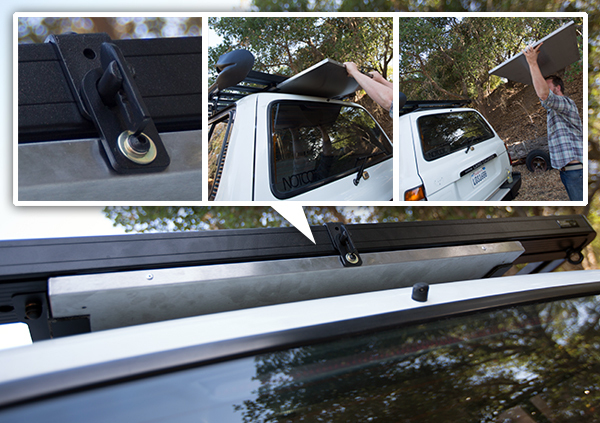 Their latest is the Slimline II Roof Rack. I love that their system is incredibly modular (versus those monstrous welded pieces that will come as freight.) Upsides to the modularity? 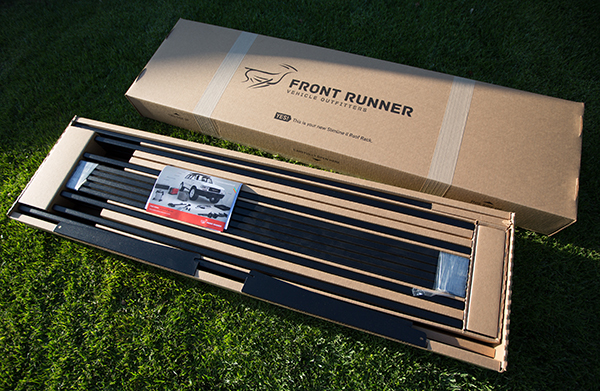 Well it packs down to an impressively efficient fedex-drop-tested-box, you can customize and adjust as desired, in case of any accidents (low hanging overpasses, etc) you can replace just the parts that get damaged versus the whole thing… and best of all, tons of accessories you can add on or create! Downside to modularity? Too many options… and then we keep trying and shifting and reconfiguring to see what feels best. Definitely a luxury problem. 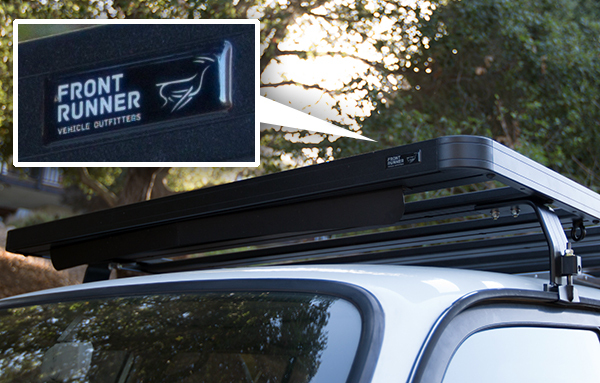 The nice folks at Front Runner Outfitters were kind enough to help our rig out with a roof rack… and then we couldn’t resist starting off with some accessories to try it all out! As you can see there’s the camp table (with mirror like underside) that slides right under the roof rack, the shower arm, tie down rings, and a ratcheting shovel mount (with snowboard boot binding-eque clasps), and more… There are so many options, this is what we’re starting with as i get to know the system, our NOTFZJ80 and figure out how we’ll be using it all. 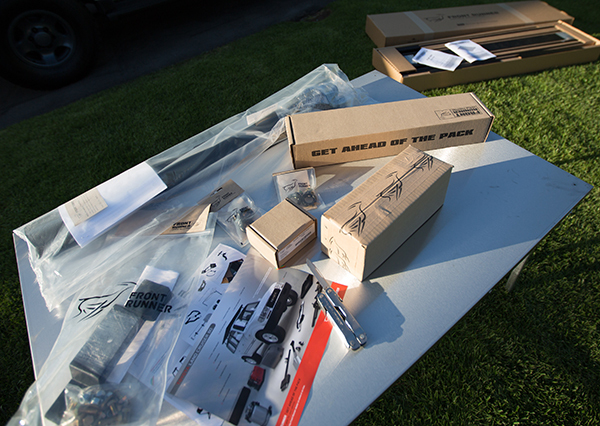 Take a peek at the unboxing, assembly, and details on the next page! The underside of the Stainless Steel Prep Table is amazing. 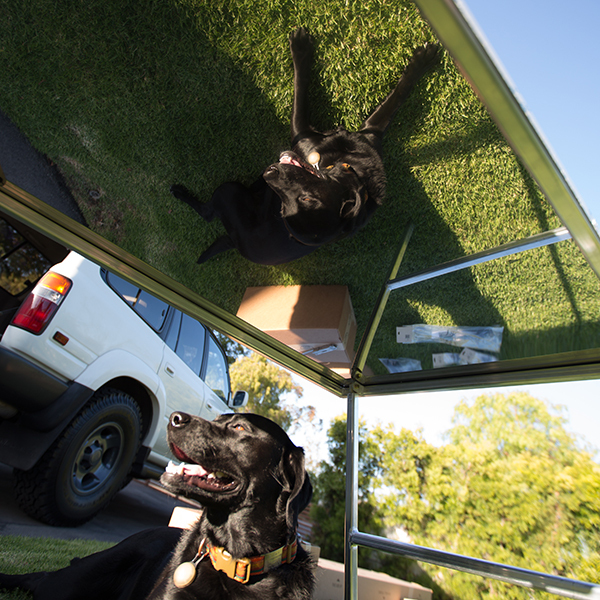 I’m not complaining though - a mirror can’t hurt at camp. Unboxing the table first also helped give us a work space while assembling the roof rack. 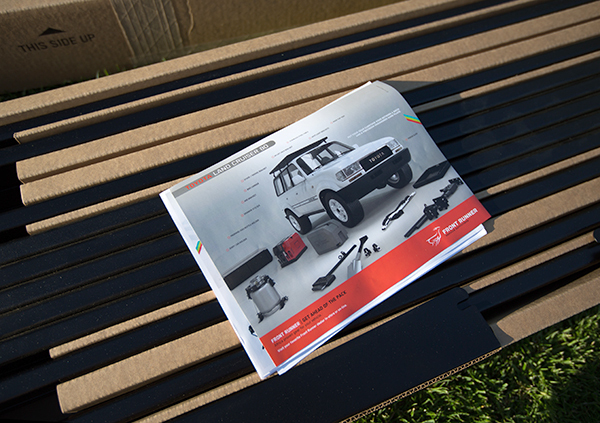 Such a nice touch that they include the one sheet for our FJ80! Their great marketing materials have been so helpful in visualizing the possibilities. 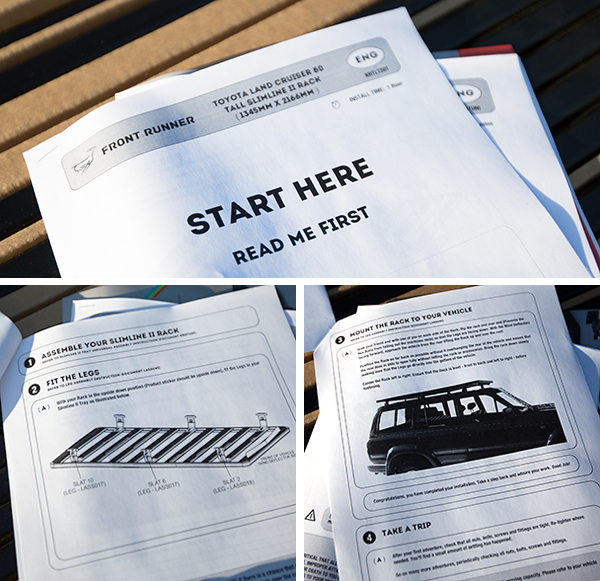 So simple… love step 4 - TAKE A TRIP! 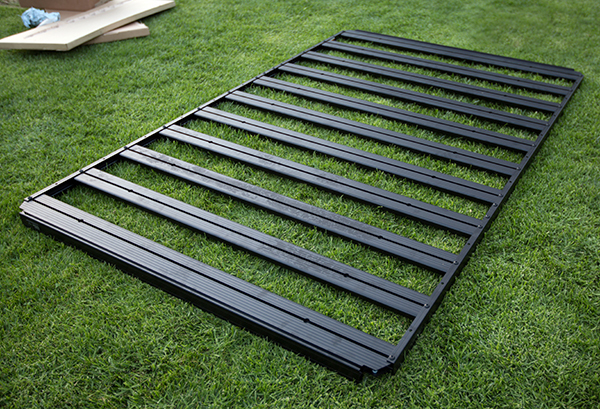 Everything attaches easily with a few (included) allen wrenches, and you can adjust where you want slats, if you want more slats, etc. Same goes for the feet! 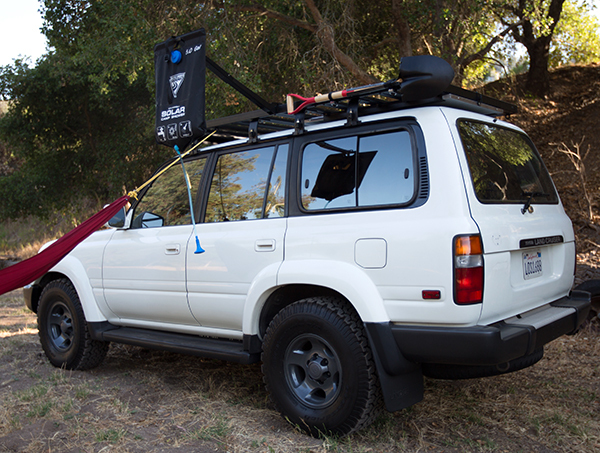 An Instagram view of our assembly and testing… from loading it all in the back of the NOTFZJ80 to shawn testing it out once we finally got it assembled, to using the tie down rings for a hammock between cars, and testing out our camp shower! Such a clean minimal design (complete with wind deflector) - you can chose a lower or higher option, and with both, the front brackets are slightly taller to account for the roof curvature. This is the taller one - figured it was better with the table slotted under and anything else we might want to tuck under the rack. After shopping enough roof racks, i really appreciate how subtle their branding is. 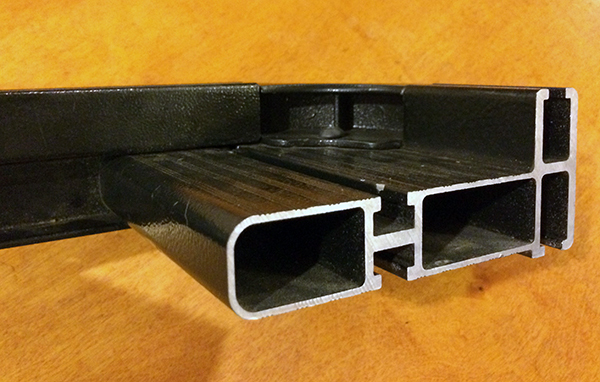 This is the gutter mounted version - so no need to drill, and after jumping around on it - it is SOLID. … popping up the hammock and shower! Here’s how the Stainless Steel Prep Table slides out of the under rack storage slides… it even has a little locking pin so it won’t slide out mid drive. For added security you can also add a lock. Tie down rings! 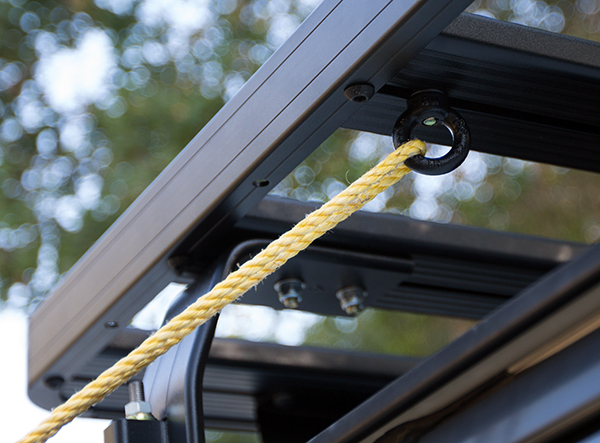 Like all of these accessories they can be fitted to the top or bottom of the rack easily and quickly moved as needed. 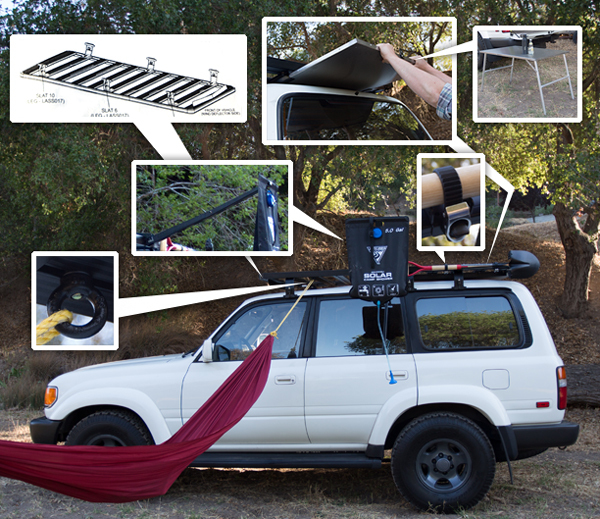 This is hammock perfect - and i’m sure we’ll come up with tons of other uses for them! Shower arm in action. 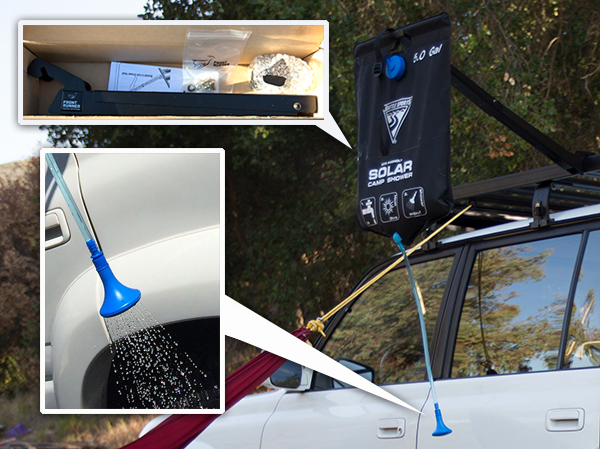 And after rigging up some crazier outdoor shower rigs at Bonarroo (there was an RV, an umbrella pole, string, and a rooftop airvent involved) this makes life MUCH easier! 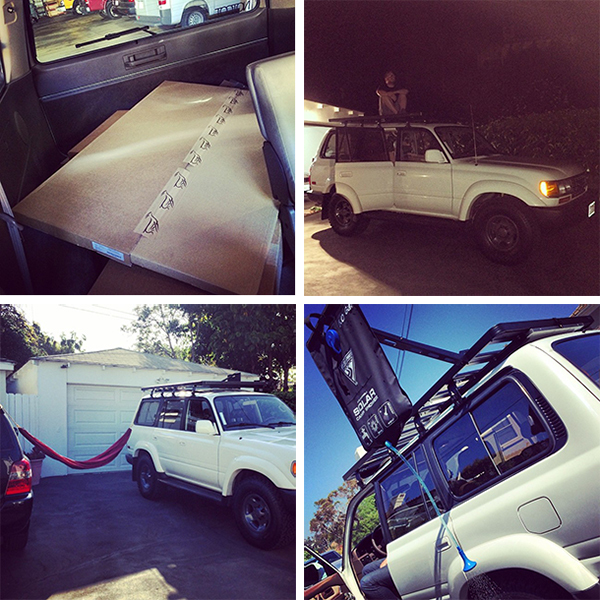 Rolling around in Topanga to test things out - the NOTFZJ80 Project is coming along!!! UPDATE: I just found this picture on my phone (from our visit to the Burbank office) of a piece of their extruded aluminum frame cut to show you what it looks like inside! David - i think the hard thing here is the sound totally depends on what you have mounted (above, in front, etc). Our biggest noise problem was when we first mounted the front light bar and figuring out which air gap was causing whistling! 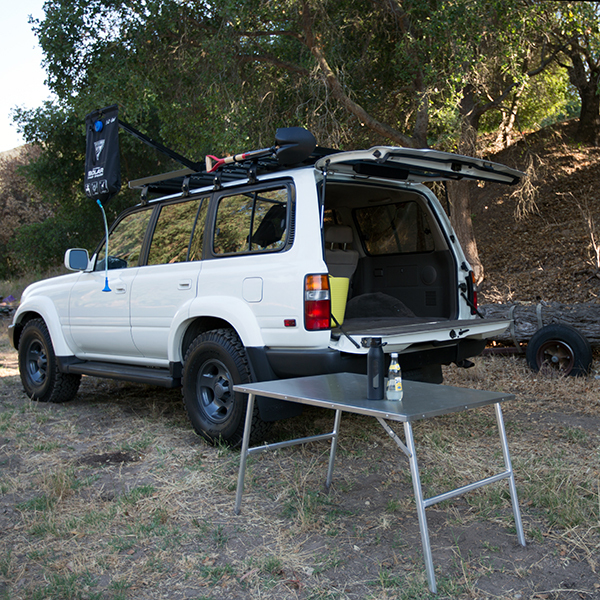 And when we put our rooftop tent on it, things changed again as well. The noise problem is more of an ‘adding non aerodynamic objects to your car’ problem in general. Every car will be different, every accessory will change it noises. It’s an endless balance! Seems no one talks about the noise of the full size Slimline II. I just did the install, excited about the look and standing on the roof was cool. It wasn’t until I opened the sunroof and tried driving that I found it is as loud as a freight train passing over your head at 55 MPH. Makes opening the sun roof NOT an option, and still annoying when closed at “highway” speeds. The thing about a vehicle is - you still have to make driving it bearable. Awesome project! 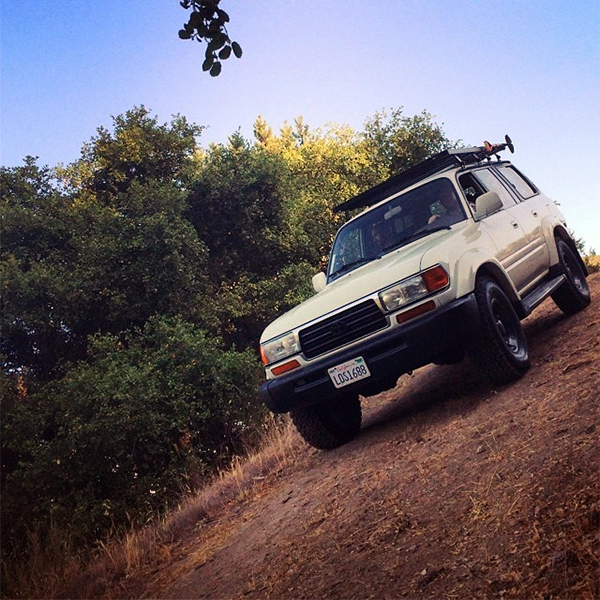 I just bought an FJ Cruiser will be doing similar modifications to adapt to a camping/off-roading lifestyle.